These days, when we rhapsodize over glorious-looking, artfully composed, Instagram-worthy food, it is remarkable that on Passover, we proudly serve one of the ugliest foods known to mankind. I’m talking about horseradish, a bumpy, lumpy, mottled brown root vegetable, with hairy tendrils reminiscent of the grizzled old witch in a classic fairy tale. Even when you peel and grate horseradish, it looks like nothing but a pile of bland, boring bits and pieces. So why do we eat it? First, The Torah commands us to eat bitter herbs (maror) on Passover. On the other hand, it doesn’t mention which bitter herb. The Exodus took place in the Middle East, where horseradish was unknown, so we know it wasn’t that. The Mishnah gives us some clues. In Pesachim 2:6 we are told which vegetables fulfill our obligation to eat maror: lettuce, chicory, endive, eryngo (sea holly), and coriander (all may be used fresh or dry but not pickled, cooked, or boiled). During the Middle Ages, it was customary for Jews in western and central Europe (as well as in the Middle East) to serve different types of lettuce as maror on Passover (which is still the maror of choice in most Sephardic and Middle Eastern families). But as oppression, persecution, and opportunity forced Ashkenazi Jews to migrate further east and north, the custom changed. Lettuce and other herbs were difficult to find in cold countries such as Russia and Poland. On the other hand, horseradish, which is native to Russia, was cheap and plentiful. And so the switch. At first horseradish was deemed a temporary substitute for lettuce, but as time went by, it replaced it completely to become traditional. 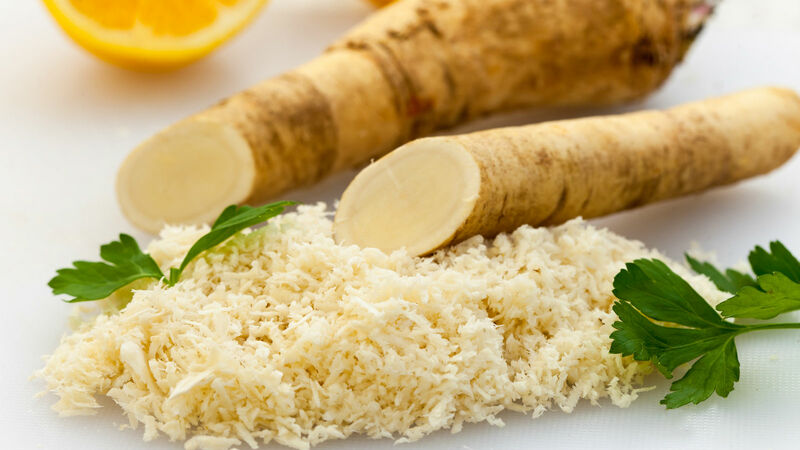 The original German word for horseradish was dropped in favor of the Russian hron, which is familiar to most of us as chrein. 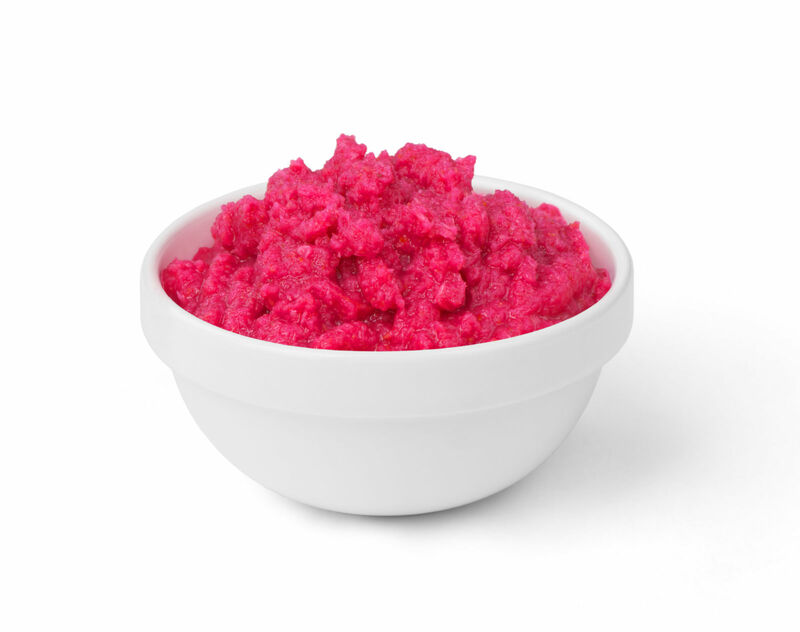 Horseradish is widely available already grated and bottled, so it is understandable that so many of us use it for Passover. After all, making it fresh can be a challenge — like other members of the botanical family Brassicaceae (broccoli, cabbage, mustard, wasabi), the oils in horseradish are volatile when you cut the flesh and the sharpness can sting your eyes. But the jarred kind is like a mild-mannered cousin to the freshly-grated stuff. It’s worth a try even if you use it only for maror and the Hillel sandwich. And consider this: As long as you have some freshly grated horseradish on hand, you should know that this grievously underused vegetable is a spectacular addition to lots of different dishes, from a creamy sauce for beef roasts and brisket to perky mayo for potato salad. You can blend grated horseradish with butter or olive oil for use over steamed vegetables or mixed into mashed potatoes. Or stir some into sour cream for a baked potato. Mix horseradish with smoked fish and cream cheese to make an hors d’oeuvre spread. Add some as a topper for roasted salmon. You can even use a small amount to jazz up classic cranberry sauce. 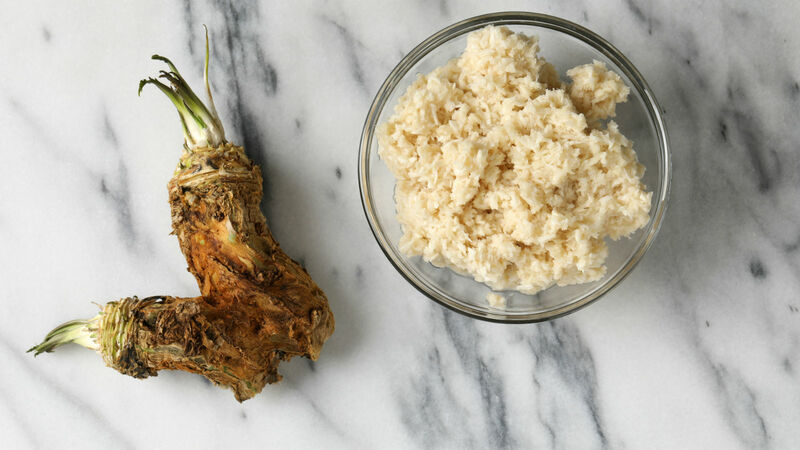 To make freshly grated horseradish, buy a whole root which you can find in your supermarket produce section. Store the root unwashed in the refrigerator (do not freeze!). Do not cut into the flesh until you are ready to grate. Wash and peel the root using a vegetable peeler; cut the flesh into chunks and use a food processor (S-blade) to grind the chunks. Be sure to turn your head away when you lift the cover to avoid the pungent fumes. Store the gratings covered in white vinegar to keep the color. It lasts for weeks in the fridge. There was nothing like lox, until we tried carrot lox. A pungent flavor addition to a traditional holiday staple.